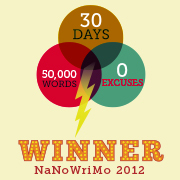 Are you going to participate in NaNoWriMo this year? National Novel Writing Month, if you’re not familiar with the nickname, is a huge international event where writers attempt to finish a 50,000-word novel between November 1 and 30. The rule: you can only write during the month of November. I first did NaNo back in 2007 and have “won” all but once in the 6 times I participated since then. The very first year I banged out about 55,000 words and spent the next six months revising the story to fill in all the missing scenes I skimmed over. The end result was over 150,000 words. Not a particularly successful result for me. I realized I didn’t have much of an idea where I was going when I started writing. Since the very first year, I’ve tweaked and perfected my novel-in-a-month strategy to the point I can write a layered, complex novel in a month, though they usually hit the 70k or 80k mark. Even when it’s not NaNo season, I use this method to plan and write my novels, and to date, every one of them has been contracted by a publisher. The novels I wrote during NaNo 2011 and 2012 have been published. 2011 was Italian Ice and 2012 was An Intoxicating Crush. This year I intend to write another novel that should be ready to send to a publisher at the end of November. I’ll be sharing my process in a series of posts on how to plan, prepare and write your NaNo story so you too can be a winner. If you have specific questions, feel free to ask in the comments, and I will answer them in future posts. I’ll also add a section on revising your NaNo novel. Smooth Draft will be offering a special NaNo editing discount. Stay tuned for more information or sign up for our Newsletter to get exclusive content and first access to all special offers.